Documenting Chris' complex ongoing relationship with Dota 2. To read more Three Lane Highway, click here. Dota doesn't evolve by increments. There are adjustments and hotfixes from time to time, sure, but this is a game of dramatic shifts. Even after all these years, Dota patch notes have retained their power to shock—perhaps because this is such a complex game, requiring thousands of hours of slowly-acquired knowledge with little hand-holding. When the underlying rules of this complex competitive sandbox get changed, years of ingrained intuition get thrown out and need to be replaced. That is what has happened over the course of the last 24 hours with the release of the 6.87 update. It'd be hyperbole to call this 'the biggest patch ever', or anything like that—after all, I felt that way when they moved Roshan, when they introduced magic lifesteal, and so on. New patches are always the biggest patch ever. 6.87 feels like a particularly big one, however. We'll be figuring out its ramifications for a while, and there's loads left to be discovered. There are an enormous amount of changes in this update. Many heroes have been changed in variously subtle and dramatic ways, and it'd take an extensive essay to go through the impact of every subtle mechanical change (like the alterations to creep aggro), the changes to the map, and the impact of every new item. If you'd like a thorough overview, put aside a couple of hours and check out this reddit thread. You'll find a bunch of long Twitch analysis sessions by professional and high-ranked players, which is a good way to get a sense of the patch as a whole. In this article, then, I'm going to run through a couple of specific changes to highlight notable buffs, nerfs, and silly sideways shifts. It's too early to say what 6.87 is going to do to the top-level meta, but here's a taste of Dota 2 in the immediate aftermath of this huge update. There are a lot of top-level changes in this patch, but here's one you need to be aware of. Hitpoints now scale more from strength, and a hero's basic health pool is larger. It's not enough to make a huge difference in the opening minutes of the game, unless you end up in one of those close-fought early teamfights around a bounty rune: expect most characters to be one or two auto-attacks tankier. Later on, though, it amounts to a chunky buff to strength heroes. 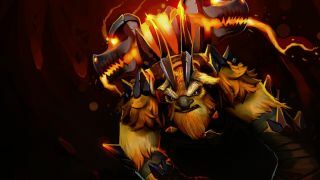 Given that the previous metagame was dominated by intelligence and agility, this is the start of a shift back towards Dota's beefy frontliners that will continue elsewhere in the patch. If 6.87 had a theme song, it would be this. People who declared that 'we LoL now' when Octarine Core and Aether Lens introduced scaling damage and utility for spells might need to hold on to something, because spell damage scales with intelligence now. Not a huge amount, mind, but enough to keep spellcasters competitive for longer into a match. This is a profound philosophical shift for Dota 2, which for years was about the tension between powerful spells and scaling auto-attacks. Now, those lines are fuzzier—expect perceptions about roles to change, particularly when it comes to intelligence heroes. This is offset a little by the boost in hero base mana from 0 to 50, but I'd argue that this is a bigger buff to strength heroes anyway. On average they gain more proportionally from the change, and the way their spells fit into their playstyle means that this extra mana opens up their options more. Dragon Knight has jumped from 195 to 230 base mana, for example, allowing him to get more use out of his freshly-buffed laning skill Breathe Fire. With a 7.46% positive winrate swing in the first hours of the patch, I'm both happy and sad to report that my most played and probably favourite Dota hero is now flavour of the month. He's been made competitive, particularly in pubs, by two sets of changes in addition to the general strength buffs outlined above. The first regards him directly. Counter Helix, his passive, now does pure damage and as such isn't mitigated by armour. It has had its damage slightly reduced to compensate, but in effect this makes him scale much better: level 4 Helix will now always do 180 damage, whereas previously it would steadily decrease as enemies stacked up their defenses. Axe hits harder, scales better, and is one of the few heroes to be unaffected by the armour aura that has been added to towers. These punish dives by characters that rely on physical damage, but Axe isn't one of those characters any more. Axe doesn't care. Blade Mail is one of those Dota mechanics, like Undying's Tombstone and the entire character of Omniknight, that requires enemies to play around it. As such, it is the bane of pubs and anywhere where coordination is in short supply. Axe is now the best carrier of an item that is uniquely able to turn a player's own farm against them, and this is what I'd attribute his spike in winrate to. It's worth mentioning that the Blade Mail buff is also a big help to characters like Centaur Warrunner, who has also had a couple of nice buffs in this patch. It remains to be seen just how big an impact it has, but I wouldn't surprised to see Blade Mail tuned back down fairly shortly. There are a bunch of nerfs in this patch—Invoker, Outworld Devourer, Death Prophet, Earth Spirit, Enchantress, etc—but Arc Warden feels like the one that has come closest to a proper rethink. Dota 2's newest hero didn't make a great first impression thanks to a cheese strat that is now well and truly dead. Having been stripped of his ability to teleport around the map with a Divine Rapier that he has no danger of losing, he has to actually use his abilities in synergy with one another. I'm not an Arc Warden player and I don't feel fully qualified to explain how his playstyle will change, but its clear that the patch raises his skill ceiling and potentially increases his utility a great deal. His Spark Wraith ghost-mines are much easier to spam and now purge, which is a big buff, while Magnetic Field needs to be used more thoughtfully—it's not enough to just stick it down on top of whatever you're trying to kill. He's now more interesting than cheesy, which will probably devastate his popularity but makes him a much more positive presence in the game. Whether or not you believe he's been dumpstered or rescued from the dumpster is down to your definition of trash. That's from my first post-patch ranked game. Mirana believed that she had survived the Rosh fight. Mirana was wrong. You can try to run from the slam; the slam does not care. The slam will find you. I've had a lot of reactions to solo Dota, but laughing maniacally in the office has never been one of them. Aghanim's Scepter, Aether Lens, Octarine Core Earthshaker is the most fun I have had in this game in years. To explain: Aghanim's Scepter now enhances Enchant Totem rather than Echo Slam, giving it the ability to be cast anywhere within a 900 AoE. This causes Earthshaker to leap into the air and cast Enchant Totem at the target location, which never stops being funny. It's an initiation and an escape, as well as an 'I must go, my people need me' button to be used during slow moments. I'm 90% sure this got added first and foremost because it is funny. Earthshaker's itemisation was a little set in stone before, sure, but he wasn't necessarily broken. He didn't need this—but I'm delighted that he got it. This change is also, incidentally, a nice little buff to Rubick (who otherwise got a bit of love this patch.) Rubick loves stealing Earthshaker's stuff, and Enchant Totem was previously the spell of choice for preventing the Grand Magus from getting Echo Slam. If you're using it to initiate, that's harder. And if Rubick has his own Scepter, then getting Enchant Totem is its own kind of reward. There's a lot more I could say about this patch, and a lot more I want to experiment with. Storm Spirit's Aghanim's upgrade, for one—a 450-range AoE Electric Vortex! Plus: Skywrath Mage's 12-second ultimate! You'll see a lot more Skywrath/Clockwerk, Skywrath/Axe, and Skywrath/Legion Commander in the days to come. And I'll do my best to cover the best/silliest/worst new combos as they emerge. If you don't play Dota 2, a speed increase of 1 is not very much—at all. This is this update's joke change, a reference to a Reddit thread from last week which generated Dota 2 patch notes by feeding previous updates into a Markov chain text generator to create a machine's idea of what a Dota 2 patch might look like. There were a lot of brilliant and impossible things in that post ('Lone Druid dies', 'Torrent now give less experience with all heroes in the Forest') and one that was funny because it was so inconsequential—increasing Puck's Orb speed by 1. So that's what Valve and Icefrog have done: implemented an idea that comes directly from a joke. They definitely read reddit, is the takeaway here. I love the idea that in a few months we'll see yet another International won by a hairs-breadth Puck play, and we'll wonder: did a a Markov chain text generator just win somebody millions of dollars?